Sometimes do you think that your home decor is a bit safe and boring with plain pillows, furniture, plates, clothes etc? You know a bit of paint would help but you aren’t confident of your painting abilities. Well, I know a really simple way to jazz stuff up with paint and give it a bit of vintage charm. Using paper doily stencils is one of the quickest ways to transform the mundane and give it a bit of vintage awesomeness. Paper doilies aren’t just for showing off appetizers and cakes. They also make great stencils as they are so cheap and come in loads of different designs, shapes, and sizes. I have rounded up what I consider to be five of the best ways to transform and upcycle with paper doily stencils and a bit of paint. 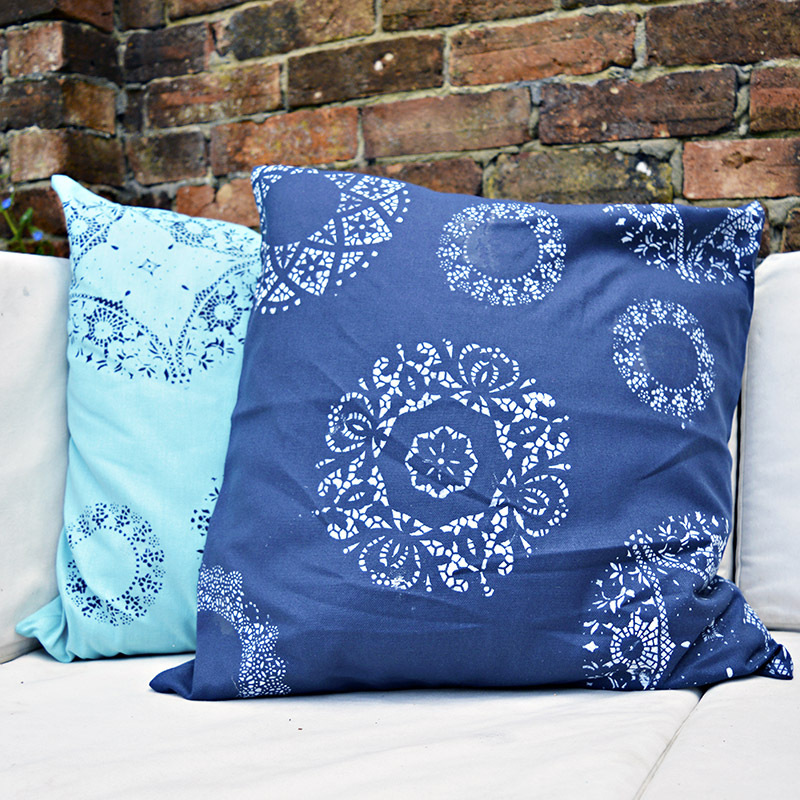 How about transforming some plain boring cushions/pillows with paper doily stencils and fabric paint. You could really have some fun here with contrasting colour combinations. These pillows are blue and white, but I think that a red pink combination would look fantastic. 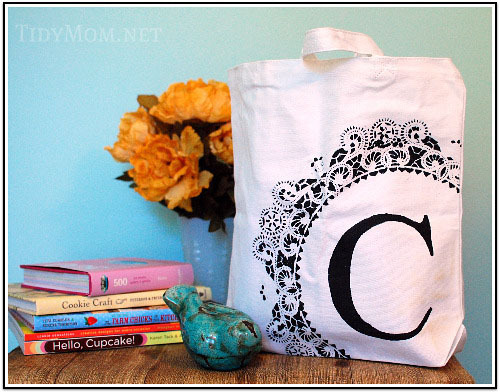 This really is a lovely tote, I love how the monogram is surrounded by the doily stencil. 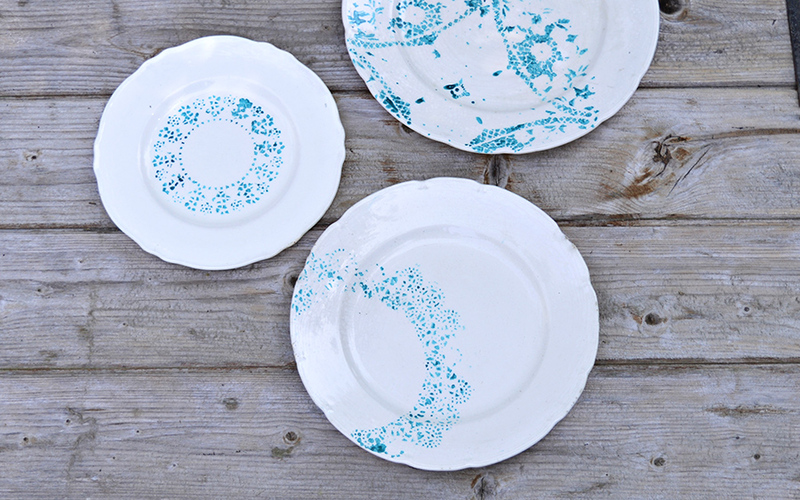 Using ceramic paints and a paper doily is a fantastic way to upcycle some vintage crockery. It’s also a great way to match a mismatched crockery set. 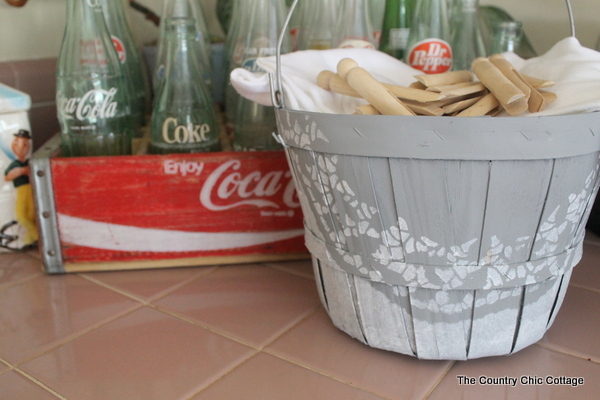 The doily stencil on the side of this bucket has definitely added some vintage country chic. 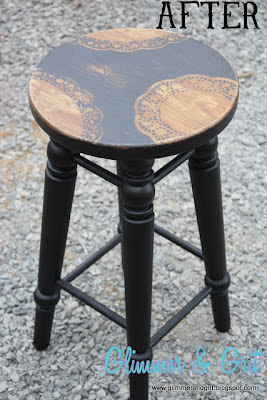 I love the way that this old kitchen stool has been upcycled with some paper doily stencils. The finished look is an amazing improvement. I love all these ideas for stencilling with paper doilies, and can think of a few more that I want to try out so watch this blog! Contrary to what my family believes, I think you can never have too many white dishes and this is a great way to give them an update. Thank you for sharing with us at Celebrate Your Story, and I hope you’re having a great weekend. Thank you so much and I’m having a great weekend. This paper doily stencils wok look really nice. Looks awesome on crockeray sets and pillows. 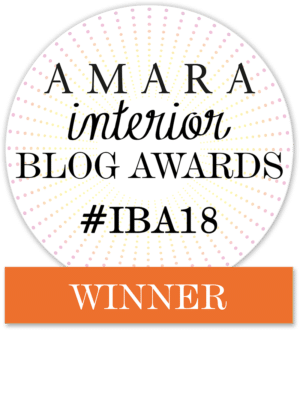 Found you on I am pinnable link party. Thank you and thank so much for visiting. Thanks Julie, I like the pillows I have them on my sofa in the garden. These are fabulous, Claire! The pillows are my favorite–pinned! Thank you for sharing @Vintage Charm! Thank you, I think the pillows are my favourite too! Claire they really are very easy to use and so versatile. I decoupaged a side table with them and love the dainty look. I really like your pillows. That was brilliant. I bet your table looked lovely. Thank you! I love all your ideas, but I think your cushions are my favourite. Thank you, the cushions did turn out well. These are all really great ideas! Love the look on each and every one of them! I have thought about doing this a million times but just haven’t had the time yet. I might get there faster now that I’ve seen this! You should try it, doilies are a really simple way to jazz something up. Thank you the bag I think would make a lovely gift. I love paper doilies and always keep a package on hand. I use them whenever I can — usually when I’m serving something “fancy” for company. These are great-looking projects. The doily designs really add a lot to the original objects. Thank you, yes you can get some lovely doily designs. How pretty these are! 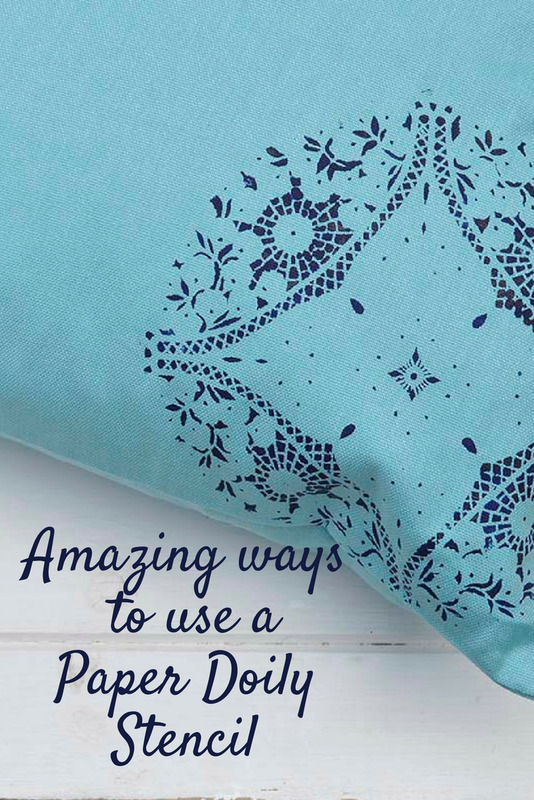 I never thought to use a doily to stencil with but it is a perfect idea. A must try idea. Thank you, they are a very cheep and effective stencil. Those pillows are beautiful and look so expensive! Thanks for sharing on the #WasteLessWednesday Blog Hop! Thank you! I found doilies at the back of my cupboard I think I had them for years, finally found a use for them. Never would have thought to use a paper doily! I love the pillows! Thank you, I think they work well on pillows. There is not one of these that I don’t want! I love the intricate pattern of the doily and have never even imagined it as beautifully used before. How wonderful to make them come alive in all of these ways. Thank you, it is amazing how a doily stencil can really transform something. Thank you, I haven’t seen plastic doilies I need to look into those more. Love doilys! All of these projects are amazing!!! Thank you for sharing. I love the pattern left from the doily! Great idea! Thanks you can get some amazing paper doily patterns. All the projects look great! I especially like the pillow case with a stencil. Thanks, I love the pillows. Can’t decide what I love more…those pillows or those plates! Either way, fantastic idea. Thanks for sharing. I LOVE the pillow idea! I just may have to try that on my next DIY project instead of trying to find the perfect pattern in the store, I can create it! Thank you, the pillows are really easy to do. I love the way each piece looks after you stenciled them. What a lovely idea. Thanks for sharing. Beautiful! I stenciled a wood box centerpiece with an old plastic doily last year. Turned out great. And the plastic made it even easier than paper! Thank you, I bet the box looked lovely.